Our daughter is named Seraphima Rose in honor of Fr. Seraphim (though, of course, in Baptism she has another saint—St. Seraphima the Virgin-Martyr of Antioch), who has been instrumental in my own Orthodox life, and so she was able to receive the Holy Body and Blood on what we consider her unofficial second name’s day. Depending on where you go, Bulgarian services may be more or less like Russian services, or more like Greek services, with an interesting mix of the two. According to my experience in various jurisdictions in America and in various Orthodox countries, the service at the monastery struck me as more similar to Greek services. The architecture of the church, the iconography, the wood carving on the iconostasis, the chant style, and the overall pace of the service all felt more Byzantine, though the service was chanted in Slavonic and Bulgarian. Sts. Constantine and Helen monastery is unfortunately not currently active, although the church on the tiny territory inside of the Sts. Constantine and Helen resort is active. The church was small and fairly full of people. There was one candle on a candle stand lit and placed in front of the Royal Doors throughout the Liturgy. As we approached the church, I heard the sound of familiar chanting. 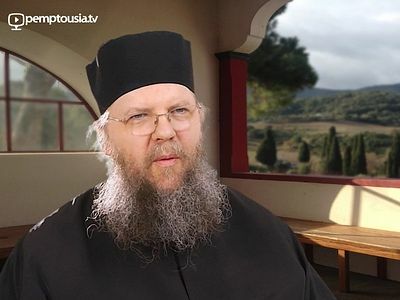 Much of the service reminded me of the Holy Protection Monastery in White Haven, Pennsylvania—one of the many monasteries founded by the Athonite spiritual father Elder Ephraim of Philotheou. I first visited this convent twelve years ago, just about a month after I had been received into the Church by Holy Baptism. The nuns were still living at their old location then, and they celebrated a Liturgy at four in the morning in a similarly small church, with one candle standing in front of the Royal Doors. The sound of female voices chanting Byzantine music today took me back to that early morning Liturgy at Holy Protection and the deep spirituality that my friends and I sensed at that Liturgy. Throughout the service I found myself thinking about how much Fr. Seraphim would have liked this monastery on the Bulgarian seaside, and how appropriate it was to be there on his day. This may seem like a strange thought at first, because, of course, Fr. Seraphim was always a faithful son of the Russian Orthodox Church Outside of Russia—but that means, ultimately, being a faithful son of the universal Orthodox Church. Fr. Seraphim was “born and bred” in the Russian Tradition, but he was no Russophile in the narrow sense of the word. In fact, one of the things he is best known for is his great love of and veneration for the saints of the pre-schism Christian West—something that he inherited from his own spiritual father, the inestimable St. John (Maximovitch) of Shanghai and San Francisco. Fr. Seraphim could just as easily make reference to the great saints of the Greek or Syrian Traditions, for example, as we see in his many articles and books, one of which is dedicated to the defense of the Western Father St. Augustine. Fr. Seraphim was simply above such petty issues. He sought only Christ, and so he recognized Christ, wherever He appeared. This universal character of Fr. Seraphim is being mirrored today in his universal veneration. After the Liturgy, I noticed on the side wall of the church, near the back, an icon of St. John (Maximovitch), which felt like more than just a coincidence, but rather a confirmation of my thought of how good it was to be there precisely on Fr. Seraphim’s day. Later, outside the church, I noticed an informational display from the Bulgarian website Pravoslaven Svyat featuring a number of images and quotes, including various icons, saints and holy men and women, such as St. Nikolai (Velimirović) and Patriarch Pavle of Serbia, Athonite elders, well-known contemporary clergy, church and monastery scenes, and so on. And right there, in the middle, was, unmistakably, a picture of Fr. Seraphim (Rose). When the priest eventually came out of the church, we had the opportunity to speak with him a bit and ask him about the history of the monastery, the liturgical style of the services, and notably, the miraculous spring under the altar, and he gave us a bottle of water from the spring. The picture of Fr. Seraphim in the display case also gave me occasion to ask him if Fr. Seraphim is well-known and venerated in Bulgaria. He said, “Yes, of course, very well-known,” and he was pleased to learn that this day was Fr. Seraphim’s day of repose. I was not surprised by his answer, but was glad to hear it anyways, from the mouth of a Bulgarian priest in Bulgaria. His Eminence Metropolitan Joseph of the Bulgarian Eastern Orthodox Diocese of the USA, Canada, and Australia wrote the introduction to the Bulgarian edition of Fr. Seraphim’s biography, which he presented as a talk at the pilgrimage in honor of the 25th anniversary of Fr. 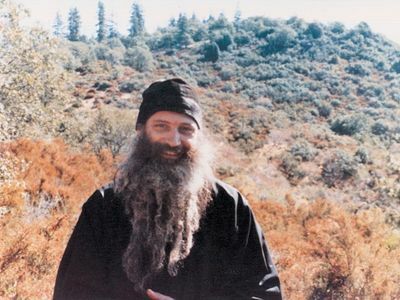 Seraphim’s repose at St. Herman’s Monastery in Platina, CA in 2007. In this talk he spoke about how at first he wondered what he, a lifelong Orthodox Christian from an Orthodox country, could possibly learn from an American convert. However, when he began to read works by and about Fr. Seraphim, he was humbled, and began to feel that he had a long way yet to go in the spiritual life. Likewise, speaking at the thirtieth anniversary pilgrimage in 2012, His Grace Bishop Daniil (Nikolov), then the vicar to Met. Joseph (he has since returned to serve in Bulgaria), spoke of how Bulgarians turning to the Church for the first time in the mid-1990s after the fall of Communism were reading Fr. Seraphim, and were also struck by how someone from a Western culture could penetrate into the heart of Orthodoxy and speak from a truly Orthodox, not psychological point of view. In his works he succeeded in bringing so clearly to everybody a defense of the truth of our faith and in overcoming that spirit which has caught the majority of people who live here… We felt that it is not enough to paint his icons and to enlighten our minds with his works, but we also needed to receive his blessing, and to ask him to help those who defend the Orthodox faith, and to bring the teaching and words of Fr. Seraphim to all our friends and to all people. According to the priest we met today, Fr. Seraphim’s words are still being brought to those Bulgarians who are hungry for the spiritual life. The same is true in many traditionally Orthodox countries. Speaking from personal experience, in my travels I have witnessed that Fr. Seraphim is known and his works are also published and sold in Greece, Romania, Serbia, Russia, Ukraine, and Georgia. His biography and works have also been translated by Athonite monasteries, and he is the only American author you will find being sold in Athonite bookstores. I visited Mt. Athos several years ago with a group of American students. As we were waiting in Karyes, one Greek pilgrim began to talk to us, and when we said we were Americans he was very excited to talk about Fr. Seraphim. I told him that I had a piece of Fr. Seraphim’s work cassock with me, and he lovingly kissed it and wiped his face with it. The same was true of church-going Greeks on the mainland—upon hearing we were Americans, they immediately asked us about Elder Ephraim and Fr. Seraphim. One monk at Vatopedi Monastery even told us that he considers Fr. Seraphim to be a new Chrysostom (!) for his work on the Church’s theology of Genesis—Genesis, Creation, and Early Man. I myself have always had a veneration and deep appreciation of Fr. Seraphim and this work, but such a high praise was never one I thought to give! But here Fr. Seraphim was, speaking to the heart of a Greek Athonite. I experienced the same in Serbia. For one example, some friends and I were visiting the monastery in Žiča where the relics of St. Nikolai (Velimirović) are kept. St. Nikolai was also born there, and his house was just up the hill. One pilgrim who knew the way offered to show me his house. As we walked, he asked where I was from. As in Greece, I said America, and he joyously exclaimed, “Hey! Fr. Seraphim (Rose)!” and he excitedly shook my hand. Archimandrite Luka, abbot of two monasteries in Montenegro, Serbia, has even named a kellia in honor of Fr. Seraphim. One year, my wife (my fiancée at the time) had a t-shirt custom made for me for a Pascha gift, featuring the famous picture of Fr. Seraphim in white vestments, holding the Paschal candlestick, serving outside during Bright Week. Later that summer I went to Kiev, and of course visited the Kiev Caves Lavra. I was wearing this t-shirt, and a woman working the counter in one of the bookstores was very happy to recognize Fr. Seraphim on my shirt. I told her my fiancée had made it as a gift for me, and she replied, “She will be a very good mother,” and I think our little Seraphima Rose would agree! In time for the thirtieth anniversary pilgrimage, St. Herman’s Monastery received a letter from some God-loving Orthodox Christians in Georgia who had written to ask if Fr. Seraphim’s relics would be unearthed as part of the ceremonies (although they were not). I was in Russia in 1998, meeting with a group of pious Russians in St. Petersburg one evening, and they were asking me questions about Fr. Seraphim. They said, “You know, Father, Fr. Seraphim is really for us.” And I said “That’s funny—we always though he was for us Americans!” And then I realized: he’s a universal saint like St. John [Maximovitch] was. Indeed, Fr. Seraphim was a man who appreciated and was nurtured by the universal Orthodox Tradition, in whatever flavor it might be expressed, and in return, God has granted him the honor of becoming a universally-recognized and venerated righteous monk, and even a saint. Through the prayers of our venerable Father Seraphim, Lord Jesus Christ our God have mercy upon us and save us! Pravoslaven Svyat also featured an article by Fr. Seraphim on their front page yesterday. September 2 of this year marks thirty years since the repose of a righteous man of our time, Hieromonk Seraphim Rose. Father Seraphim’s contribution to the spread and deepening of Orthodoxy not only in America, but throughout the world cannot be overstated. A gifted man from birth, he came to his deep faith in Christ and firm belief in the truth of Orthodoxy through intense struggles of soul and mind—struggles so painfully familiar to people of our age that we cannot but acknowledge the veracity of the conclusions he unwaveringly drew from them. His life edifies even in its imperfection, for truly he was “one of us”: For in that he himself hath suffered being tempted, he is able to succour them that are tempted (Heb. 2:8). Father Seraphim pray for us! Well written, Jesse! Keep 'em coming! 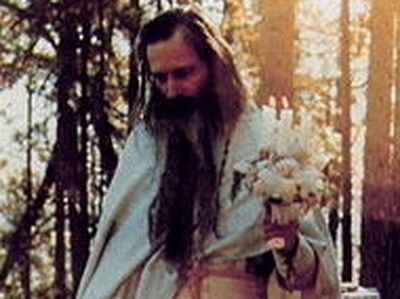 I knew Father Seraphim (Rose) personally before he was ordained to the priesthood. In 1975 I lived at the St, Herman of Alaska skete as a lay worker for seven months, and Fr. Seraphim was my spiritual father during that time. (A spiritual father does not necessarily have to be a priest.) Some expect that one day he may be glorified among the Saints. If that happens in the short time I have left (I am no longer young) I will be honored to have known a Saint personally.